kelbysews: Done Ditty Done Done Done! Done Ditty Done Done Done! Here she is in all her glory, the BEST BEE QUILT EVER! I know I've posted about this quilt before, but I finally finished the binding so it's really, truly done now! I managed to get all the Good Folks line from fabric.com when it went on sale for $5/yard--I so wish I would have gotten more! I almost cried when I cut up all my 1/2 yard bundle to send to my quilting bee ladies, but I'm so happy I did! I received 25 of the best bee blocks from two of the best quilting bees, the VIBs and Twice Around the Block! I can't thank you ladies enough, especially those of you who made two blocks! My dear friend Angela even made me a rainbow block because she knows what a sucker I am for a good rainbow! Krista did an out-of-this-world custom quilting job for me! I never send quilts out to be quilted. I truly like having a hand in all the steps and really enjoy quilting, but sometimes the quilt demands more than I can give. This quilt was so special to me I knew it needed something unique and I trusted Krista completely. I gave her no instructions on how to quilt it, just to do what she wanted. I'm so happy I had faith in her amazing artistic abilities because elements like this monogramed "K" took my breath away. This is my favorite print from Anna Maria Horner's Field Study line! I thought the colors worked nicely with all the Good Folks and Kona Ash on the front of the quilt. I decided to use Good Folks Buttoned Up in Ink for the binding (thanks to a sweet IG friend's destash!). Really, I couldn't have designed a better binding! I love when the binding gives a solid frame to the quilt--probably why I use black and white binding so much--but the hint of plum in there just ties the front and back together for me. Yes, I actually hand stitched the binding down. Honestly, I do prefer this method of binding and enjoy doing it, but I make too many quilts to do it every time. I try to save it for extra special quilts--this being the most special quilt of all! Thanks again to all the ladies who made this quilt possible! I will treasure it always! WOW!! Amazing quilt! The colors and quilting is awesome! Krista...did do a great job with it! So thrilled for you, Kelly! Absolutely GORGEOUS. Truly a work of art! Just so very pretty to look at - enjoy!!! This is a truly amazing quilt. The colors are vibrant the quilting amazing! Everything about this quilt is beautifully breathtaking! Love it! It's an amazing quilt, you can be so proud and happy. is lovely!!! wow but that is gorgeousness! Kelly what a work of art this quilt is! Well done to the ladies and Krista as well. Such gorgeous colours! And what incredible quilting - well done Krista!! Wow! I love everything about this quilt!!! Oh my gosh - this is so beautiful! 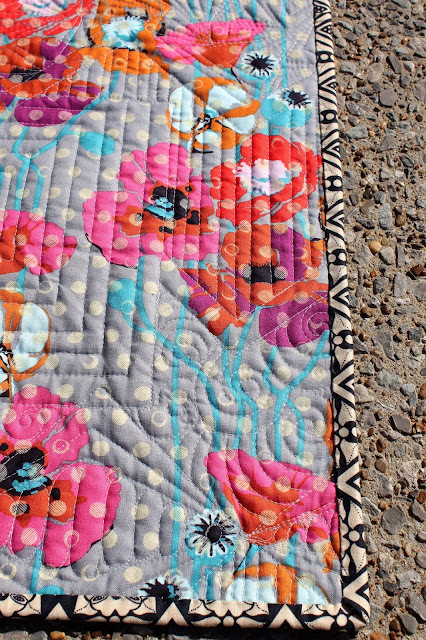 It looks fabulous, both the blocks and the quilting! it's such a fun to look at quilt -- so many exciting things! Looks beautiful Kelly! That is amazing in every aspect! You were so right in getting it quilted. Just gorgeous!! !